Lazy Summer Days Ahead under a Eclipse Retractable Awnings or Shades. It’s a lazy summer day and you’re all quite content to hang out in the back yard or on the patio under the Eclipse retractable awning. Fresh air is always wonderful, but no one needs direct exposure to the harmful UV rays of the sun. So when the awning rolls out, you know you’re protecting yourself and your family. 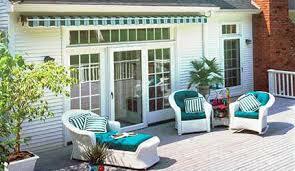 Motorized retractable awnings block up to 98% of the sun’s dangerous UV rays and supply significant cooling. It was also obvious that with a retractable awning from Eclipse Shading Systems® on the back of the house, the inside rooms on that side were cooler. Of course, that translated to lower energy bills, so you had one installed on the front. Relaxation and conversation were well underway when you heard a car pull into the driveway. You both got up to go see who it might be. What a great surprise to see old friends just dropping in to say hello. Eclipse solar protection products are the best you can purchase to reduce heat gain and lower indoor temperatures, reduce sunlight and glare, block UV rays, reduce indoor fabric fading, and block light rain. Our exclusive products include retractable awnings, freestanding butterfly awnings, retractable exterior solar screens, and retractable interior solar shades as well as accessories like the Eclipse Drop Shade that provides increased protection from low sun, the Lunar Lighting Package, and the Solar Beam Infrared Heater for cooler evenings. When old friends drop by in the afternoon to spend some time and everyone pitches in to make a great outdoor summer meal, how can you refuse? Eclipse retractable awnings…a set up for a picture perfect summer day.